When you wake up in the morning, what is the passion that fuels you to start your day? Are you living this in your work? If others asked you what drives you to achieve..
What would you say is your motivation? Some days are awesome, right? And then other days you are not feeling as inspired? If you feel this way at times or everyday (hey no judgement here!!) this blog post is for you! 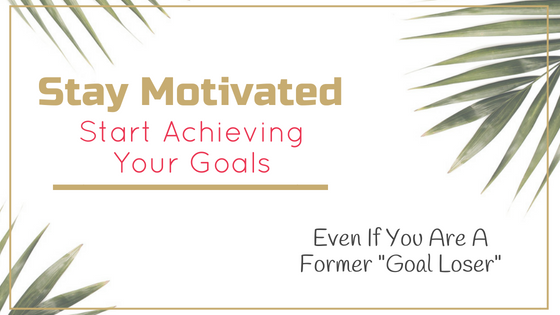 I am dishing on how to stay motivated in order to stay on track to hit your goals! If you missed it, I have a blog on how to start setting goals. It is a great read and as a former loser goal setter… it changed my life! You’ve set your goals, created a strategy… now you need to figure out how to stay motivated! Am I right? There isn’t a simple formula that works for everyone when it comes to motivation and achieving goals. The idea and concept has been pondered by motivational speakers for years. People pay thousands of dollars to attend motivational speaker events, such as Tony Robbins. They leave the seminar- feeling excited, empowered and ready to conquer the world. However, 3 days out, a week out, a month out. The majority of the people who attended, all that motivation and new energy is GONE! I wish there was a simple formula we could all apply. To feel motivation all the time! You know, something we could just dial right into! The list goes on… everyone has goals or wants to improve themselves in some way. What motivates you vs. what motivates me could be totally different! A lot of people think that money is a sole motivator but that isn’t true in all cases. Even large corporations want to know what motivates! They spend thousands of dollars administering personality test to their employees. Tests such as, Myers-briggs or DISC . The tests unveil behavior patterns and gives them a glimpse into how the company can manage their employees. Manage them to achieve goals and to perform better. Let’s talk about what will keep you motivated to stay on track! How are you going to keep the initial excitement of “I’m going to conquer the world attitude”? Let’s look at a few ways to start working on your motivation! Write down your goals and the positive attributes that they bring you. I suggest doing this in your own handwriting. Then hang it tin a place where you can see them all the time. Such as in you office. On the refrigerator. On the bathroom mirror! This allows them to be relevant, you see them, they are more likely to happen. In the beginning of 2017, I made a list of task and activities that I wanted to achieve in 90 days! I made a list with different color bright markers on a 11 by 8.5” piece of paper. I hung them on my refrigerator and on the mirror in my bathroom. I achieved every single one of those goals! If you have followed any of my videos on Facebook. You now know that I use to make horrible New Year’s Resolutions. Resolutions such as, “say more bad words,” “eat bad foods!” Because in my mind if I failed, which inevitably happened, I was winning. I realize how pathetic and sad that is! But I am being transparent! There was something refreshing about checking off the goals and task as I completed them. Want to feel that same level of accomplishment? Do you want to start winning at business? Knocking out those goals and setting bigger ones? Here are a few techniques that will help you stay motivated and on track! Writing down your goals in your own handwriting. There is something that triggers when you write it down instead of typing them out! Make daily list of items that need to be accomplished, check them off as you complete task. Go for a run or a walk/ I do this sometimes in the middle of the day to clear my head and reclaim my motivation for the day! Reward system- reward yourself for small wins. Larger rewards for bigger goals! Be prepared… don’t wait to the last minute to do things. Plan your day. Stress will kill motivation! Focus- give yourself an allotted time each day to work solely on your goals. Accountability Partner- Finding someone that can hold you accountable! Mindset- Say your goals out loud everyday. Share your goals and what you want to accomplish for the month/quarter/year with others! If you fail, allow yourself to learn from it but move on. The past is in the past. You have a fresh new start from this minute on! Dress to impress! If you work from home. Get up shower and put on clothes. Set alarms to remind you that it is time to work on your task or goals. These are a few ways to stay motivated! You have to find out what works best for you! If you are overcoming bad habits, this may be challenging but stick with it. You will succeed. I have a printable worksheet (that is pretty!) that you can download and hang up! You will find it The Vault! Printable Worksheet To Keep You On Track To Achieve Your Goals In 2018! Success! Now check your email to confirm your subscription and receive your Free printable Goal & Motivation Worksheet!